San Francisco’s tech driven economy continued its multi-year uptrend in 2014. Encouraging growth in the broader economy, including stock indexes all-time highs, has supported the local commercial real estate boom. Starting rents in San Francisco averaged $51.29 PSF in 2014, gaining 12.6% year-over-year and beating 2013’s gain of 10%. 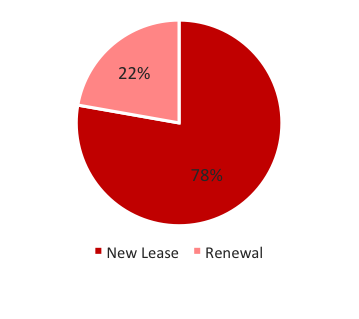 At the start of 2014, we reported rumors about a number of tenants in the market for 100,000+ square foot spaces. These rumors came to reality as 17 deals over 100,000 sq. ft. were signed, compared with only 8 equally large deals signed in 2013. The trend indicates that companies are preparing their resources for continued growth over the next few years. The commercial real estate market in San Francisco has not shown any signs of weakness despite the Fed’s planned interest rates hike later this year and increased volatility in the financial markets. However, it is important to note that the tech-tenant rich San Francisco market could be particularly vulnerable to any fluctuations in the macro economy. The technology sector tends to grow and contract at a faster pace than most other industries; if economic recovery stalls in 2015, the San Francisco market may be hard-hit. Starting rents for office properties in the CBD (North and South Financial District) ended 2014 just below $57 PSF, an 8% increase since the beginning of the year. Still, rental rate growth has slowed slightly over the last few years from +28% in 2012 and +12% in 2013. That could explain the flurry of building sales in the past year as investors look to cash out on their stellar gains. Tenants with current CBD leases that are expiring in 2015 will not be pleased to find out how much more they will have to pay to stay within the submarket. 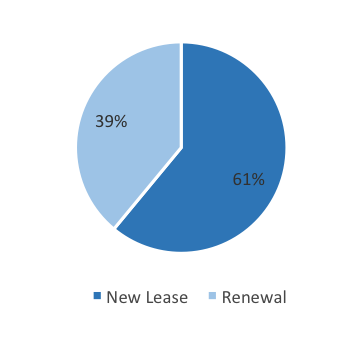 Current rents of Full Service leases executed between 2010 and 2012 and expiring in 2015 average $39 PSF. As a result, tenants who are looking to renew in the CBD will face increases of $18 PSF, or 46%, to meet current starting rents of $57 PSF. Concession packages have remained flat over the past few years, down only 1% since 2012. With its supply of larger floor plates and spaces, the CBD continues to retain large financial and law firms who have always been partial to the submarket for its Bay views, central location, and historic addresses. Notable transactions reflecting this tenant mix can be found in 555 California St, where financial firms Dodge & Cox and Bank of America, and law firm Kirkland Ellis signed long-term renewals of over 100,000 sq. 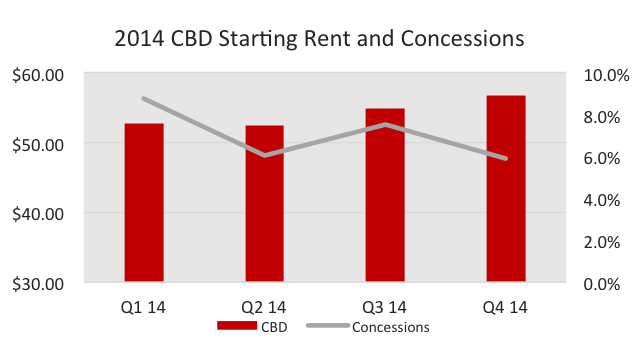 ft.
Office space demand was strongest outside the CBD as properties saw 15% starting rent growth year-over-year, considerably higher than that of CBD rental growth. The growth in demand is driven by the changing preferences of new tenants, mostly in the technology sector. A majority of tenants in this market favor creative spaces with character over Bay views and a prestigious address. 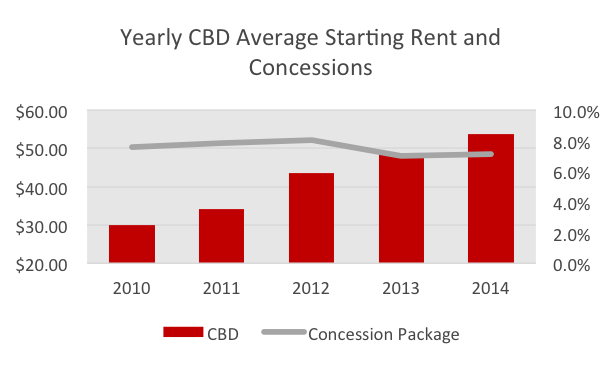 Lower rents and easy access via public transit also help seal the deals inked outside the CBD. 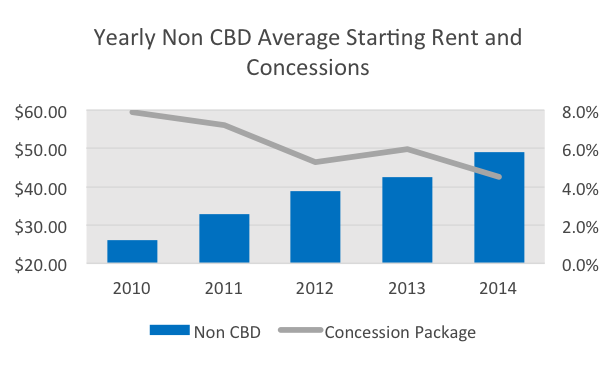 This increased demand helped owners of Non CBD buildings see starting rents grow at a faster pace than the previous year and at a greater rate when compared to buildings in the CBD. 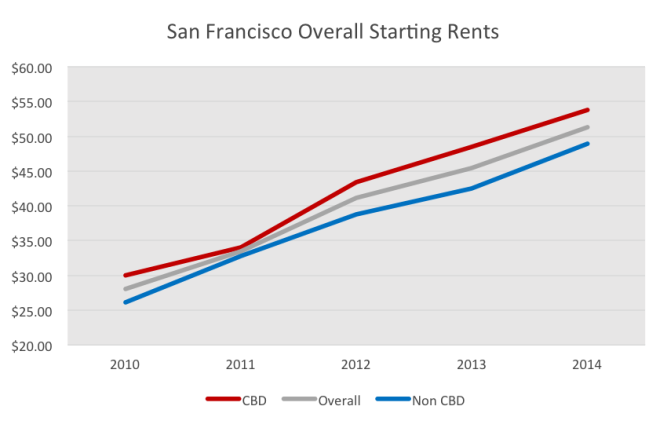 Over the last five years, starting rents in non-CBD buildings have increased from an average of $26 PSF in 2010 to an average of $49 PSF in 2014, an 87% increase. In the fourth quarter, high demand for office space on Brannan St and in SOMA has pushed starting rents there to just above $54 PSF, with no increase in concessions. 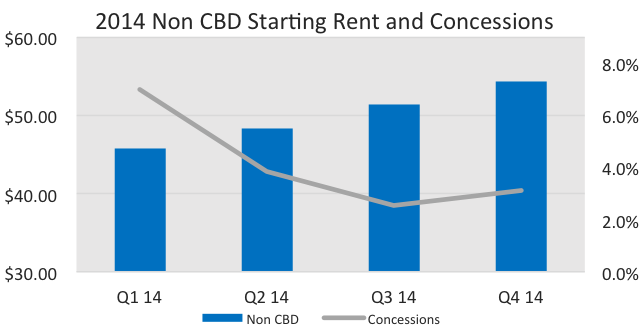 With rents growing at a faster pace in Non CBD buildings over the past year, the spread between CBD and Non CBD office rents narrowed to 5.5%. Decreasing concession packages also signal that this continues to be a landlord market. Concession packages in 2010 were equal to approximately 8% of the total value of the lease. In 2014, however, concession packages ended the year below 4%, providing additional income for owners. The Effective Rent Report is produced by CompStak, Inc. For comments or questions, please contact Blake Toline: Blake@CompStak.com or Noam Shahar: Noam@Compstak.com.